we can claim as our own, or decide to change something in our life, do we realize our action is a culmination of all the decision-making we have done in our lifetime. And when the prize brings us the greatest joy and the deepest warmth, we know we are at the top of our game in all things. 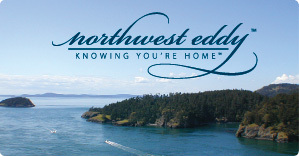 We at Northwest Eddy™ assist our clients in keeping this fundamental idea in mind when they seek for themselves, or offer for sale, their primary and vacation homes, or real estate investment property. The real estate transaction process is much like traversing an eddy in a kayak. The water currents shift and change constantly; taking all your concentration to maneuver lest you find yourself flowing in a direction you do not want (or in the case of a real estate transaction, settling for a house that meets your needs but not your desires). However, at Northwest Eddy™, we focus on the figurative definition of an eddy: "...the turning aside or departure from the main current of thought or life." This allows you to make unhurried and sound decisions throughout the real estate transaction. Northwest Eddy™ staff has extensive experience working as consultants for entrepreneurial and high-tech companies, both global and local. This gives us an understanding of the time constraints, pressures and distractions our clients face on a daily basis. For this reason, we do more investigating, informing and communicating to assist you in developing your own point of view and plan of action for selling, purchasing or refurbishing your properties. All it takes is a call or to begin the process.